Wait… what? You want to forcefully dismiss your keyboard? A-B-S-O-L-U-T-E-L-Y! Thereby the screenshot and the blurred view had the Keyboard visibility, which was pretty ugly, and my UX Lead wasn’t happy about it (perfectionists! lol). Although this was no way possible out of the box from Xamarin Forms, I was asked to get rid of it one way or the other. Nah I Didn’t give up! So after trying out many different solutions to get rid of the Keyboard visibility when the screenshot was captured, which ended up failing, I finally had the moment of “eureka!”. Basically, what I did was to create a dependency service which would forcefully dismiss the keyboard, as in, push down the keyboard from which ever the current view of focus. Up on the Entry’s Completed event I would first of all call up on my custom Keyboard dismissal service and then perform the screen capture and blurring view effect and so on. Which worked out pretty nicely! Yeah here’s something I built up to demonstrate the awesomeness of this hack! you want to limit the user from entering text into an Entry after a given timeout? may be dismiss the keyboard after a certain text length is reached? instantly dismiss the keyboard straight from the ViewModel itself without having to go through a UI Event chain? So there’s no doubt we need to drill down to the native level when we try to push the limits of Xamarin Forms Framework, as usual. In Android we could gain the access for the InputMethodManager which gives us the capability to hide the keyboard on demand. And on iOS we use the UIApplication instance which gives us the access to the PresentedViewController property (current active ViewController), in return allowing us to call the EndEditing on its View to resign the first responder. Finally I unite those two native calls via dependency service and be used from Xamarin Forms PCL level. Now we could use this interface to do the native implementations which could be used via DependencyService of Xamarin Forms. Next native hacking… or short circuiting you could say! This is the time for native project level implementation of our service. Go ahead create your platform specific implementation of the IForceKeyboardDismissalService interface. So for Android, we need to access the current Activity to access the InputMethodManager, for which we would use the Plugin.CurrentActivity library. So if you don’t have it, you might as well go ahead add that to your solution via nuget before implementing the below. As you can see we are calling up the HideSoftInputFromWindow() method to dismiss the Keyboard via the InputMethodManager instance we retrieved. Oh don’t forget to add the assembly attributes to register this for the Xamarin Forms DependencyService. Then on iOS, we already have the singleton access to UIApplication where we are given access to the active PresentedViewController, which holds the instance for the current active view controller. Alright now time for the consumption of some cool code. 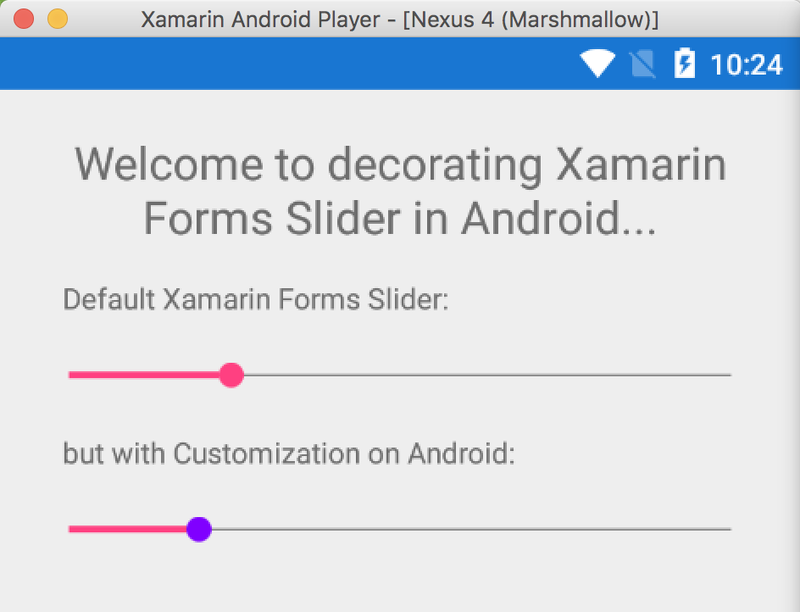 Here’s how you could use the above awesome service in Xamarin Forms. Now don’t worry I shall not leave you hanging fellas! It all started a few weeks back when I was playing around with the Slider control to add a whole bunch of complex visual features in one of my company apps. Alright, first thing first, we need set up our Custom Slider control first and attach it’s Custom renderer in Android. Now keep in mind all the customization that we are doing later will be done within this custom renderer. Decoration 1 : Change color theme! Decoration 2 : Change only the Slider’s Thumb Color? Android SeekBar (which is the native handler of Xamarin Forms Slider on Android) has the Thumb property which allows you to customize the appearance of the little thumbnail head of the Slider control as we have used above. Decoration 3 : Change progress background Color? How about changing only the Progress Bar’s background color? As you can see below..
Look at the boring default progress bar’s background color vs the purple background color! 😉 pretty cool! Decoration 4 : How about adding a secondary progress indicator? Now in Android we have this built in property called SecondayProgress which allows you to set a secondary progress value to your Slider or Seekbar as of native Android handler. There you go, you can see that we are setting the SecondaryProgress value, but also take a closer look at the calculation that we are doing before setting it. 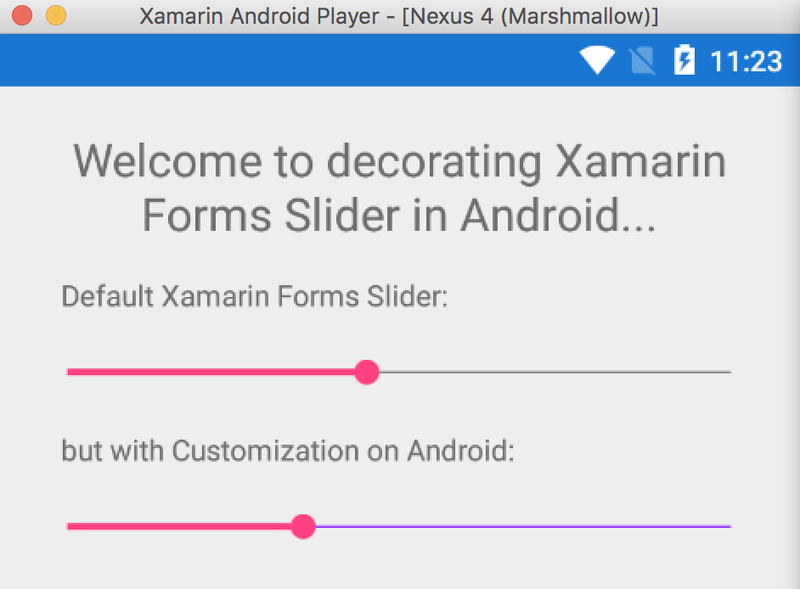 Now Xamarin Forms Slider and Xamarin Android Seekbar which is the handler for the Slider control, uses different value types or unit types for setting the Progress and the Secondary Progress values in native level. If we want to set the value from Xamarin Forms value units then we need to convert that value to Android Seekbar’s native values which is exactly what we are doing at the calculation. So basically we are setting the Xamarin Forms unit value according to the native units to Seekbar control. Decoration 5 : May be change the Color of secondary progress indicator? And hey of course don’t forget to set the SecondaryProgress value while you’re at it! Decoration 6 : I would call it Funky delight! Well what I mean is, let’s try adding different color’s to Thumb, Progress Bar, Progress Bar background and Secondary Progress Bar! Too much funky? I thought so! Your imagination is the limit fellas! Decoration 7 : Remove Thumb Header may be? It’s pretty simply actually, simply set a Tranparent ColorDrawable to the Thumb property. Decoration 8 : Let’s kick it up a notch! 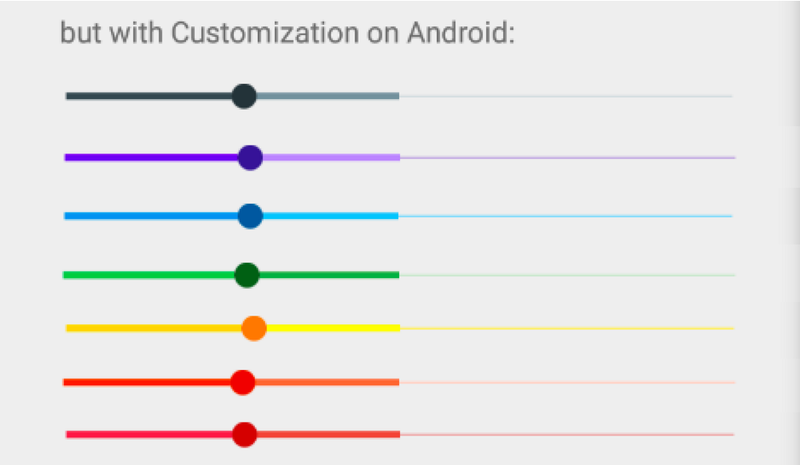 So to achieve that, we shall be using Android native Styling with Drawables such as Shape, Gradients and so on. So to explain the above a little bit, we have created a Style layer-list which assigns the given styling items to the specific id’s of the SeekBar native control, such as the background, secondaryprogress, progress as you have noticed. Those drawable objects will replace the default styles of those segments in the SeekBar with these defined drawable objects. First we are using a Shape drawable to to the Background property, which creates a gradient layer with the given colors and angle for creating a gradient effect! Also we are setting a radius value to corner so that the corners will be curved nicely. Next for the Progress and the SecondaryProgress properties we are creating a similar Shape gradient as before but we are clipping it according to the given values of each of them. There’s how you set it in the custom renderer level, simply call the SetProgressDrawableTiled() method by passing the custom style of what we created above. Also I have disabled the Thumb, just to make it look cooler. Its up to you though. Additionally you could have bitmap images or nine patch images as drawables to styling and so may other stuff. Now this is like the holy grail.. where as you can see with Android you get full flexibility for any kind of complex customization! Decoration 9 : Can I reduce the above overridden Height? So you’re worried of the height after setting the custom styling drawables as above? 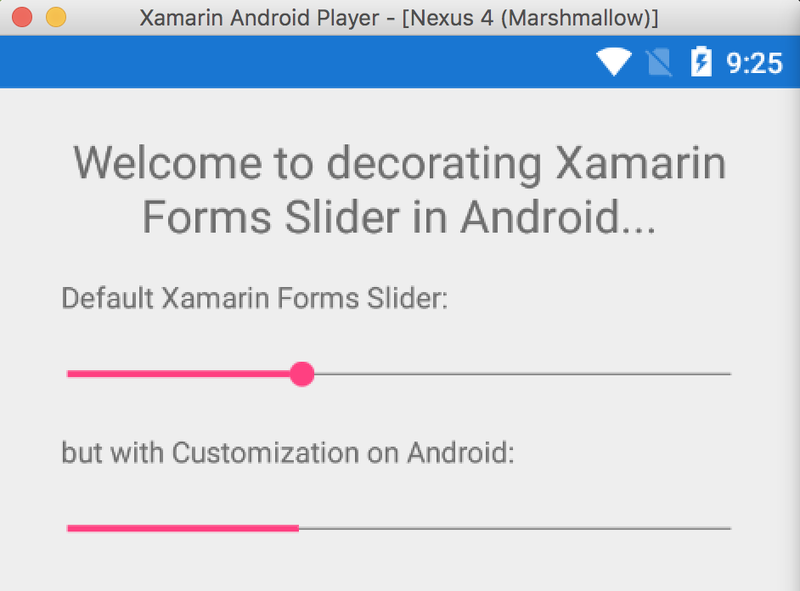 simply reduce the HeightRequest value in your Xamarin Forms code for our custom Slider view. Right after we set the Custom ProgressDrawable styles in the renderer level, it overrides the Height property of native SeekBar that’s assigned from Xamarin Forms level for each of those sub-views (ProgressBar, SecondaryProgressBar and Background sub views), so they expands themselves to the fullest as possible with the new Drawable objects. So the above should give you control over the Height issue! Decoration 9 : Can I have the above cool-ness programmatically without resources? So you don’t like to deal with Android Resources and creating the Style XMLs and stuff? Oh sure, no worries! but you will have to do a little bit of work to get the above simple XML Styling into pure code generated objects! So let’s see how we could create Drawable Style objects in C# code! Now keep in mind all the Drawable objects we used in our XML file “custom_progressbar_style.xml” has their own programmatical counterparts such as Shape, Gradient and Clip by the names as ShapeDrawable, GradientDrawable, and ClipDrawable and so on likewise. So basically we are creating our our Drawable objects programatically, in this case PainDrawable objects and giving them different styling values such as Radius, Clipping, IntrinsicHeight and so on. 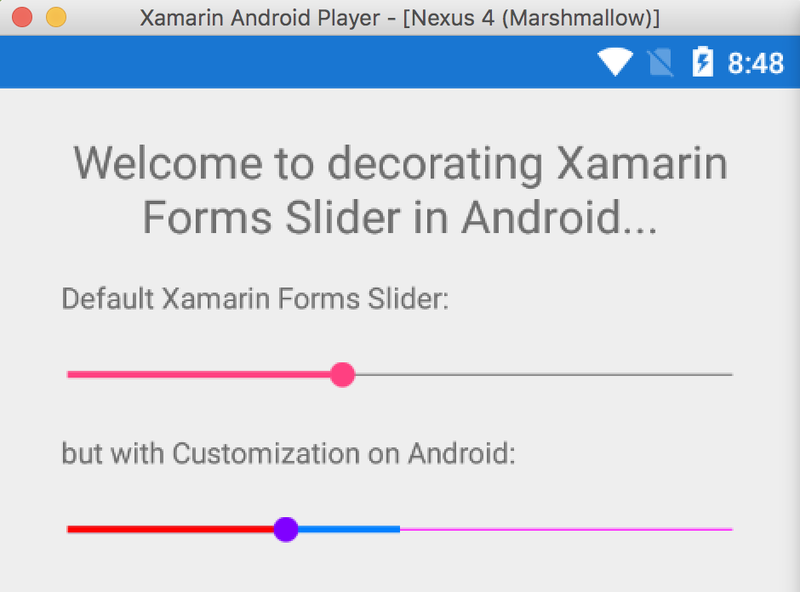 And then at the end we are going to retrieve the references for the sub-views of our native SeekBar in Android which is the after-rendering counterpart of Xamarin Forms Slider as I mentioned at the beginning. This is going to be a LayerDrawable object, which is going to allow us to set our own custom Drawable objects to each drawable layer by their IDs.